The site known as Buddha Park is an otherworldly collection of Buddhist and Hindu statues scattered around a riverside meadow. Priest-shaman, myth-maker and sculptor, Luang Pu, designed and built the park in 1958, fusing philosophy with mythology and iconography. 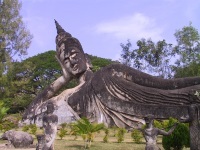 Visitors will discover that the detail on many of the statues is decidedly atypical of Laos. Indeed, much of it is quite unique. Visitors are sure to enjoy climbing and exploring the structures and should look out for tourist pleasers such as the beautiful Tree of Life sculpture and a pumpkin-like statue. The latter's steps lie inside its gaping mouth and lead to a viewing platform. Visitors are free touch the statues, take photographs and explore without much restriction. They'll also find a restaurant that serves decent food. The trip to Buddha Park is fairly lengthy, though the region's rural scenery is interesting in its own right.